1930’s Swimwear of the Stars ! 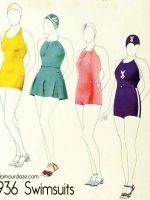 Glamourdaze reviews the latest styles for summer 1933- Besides having hair that’s the envy of all the other girls in Hollywood, Ginger Rogers has a bathing suit that can be seen from one end of Maliby to the other. Why shouldn’t she look happy? And Joan Blondell says nobody’s going to get more Vitamin D this summer than she is…. Glamorous 1930’s bathing beauties at the Hotel Delmonte in Monterey California. A favorite playground for Hollywood’s movie stars back then. This clip dates from 1935.